I told you I was going to go to Half Price Books and I did. The first book is Black Fly Season by Giles Blunt. This is an upcoming read for my mystery book group. I’ve heard a lot of good things about this author (I’m not sure if this is a series book) so I am hoping it’ll be a good crime novel. The next two books are by Angela Carter, The Passion of New Eve and Shadow Dance. I know some of you in the blogosphere are big fans of Carter and I’m hoping I finally get read something by her this year. Next is Burger’s Daughter by Nadine Gordimer. It seems I’ve been accumulating a few of Gordimer’s books. They just sound so interesting. The other book is Indiscretion by Jude Morgan. I remember when this one came out it seemed to be quite popular in blogland. 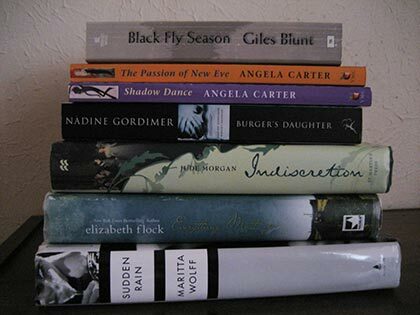 The other two are Everything Must Go by Elizabeth Flock and Sudden Rain by Maritta Wolff. So I’m quite excited that most of these, save the Flock book, are by authors new to me. Have you read any of these? And, most importantly did you already buy some new books this year? The Passion of New Eve is such an amazing book! I haven’t read Shadow Dance yet, but you can’t go wrong with Carter. Enjoy your new books! The only book I’ve purchased this year was a slow cooker cookbook, which I’m going to desperately need when my son starts tackle football later this year and practices five days a week. (ugh) I’ve not heard of any of these books, but if they’re half price, I love them already! I’ve heard great things about Blunt too. I look forward to reading your thoughts on your book club book. I really liked the one Flock book I read and am hoping to eventually read another. Hopefully you’ll like Everything Must Go. Enjoy your books! Giles Blunt is excellent. You and your group will really enjoy this author. No new books. At least, not yet. I bought my dad Julia Child’s cookbook for Christmas, though, and we’ve been having fun looking at the recipes and planning out which ones we’re going to cook in the coming week. I read Sudden Rain. It’s very 70s, but I enjoyed it nonetheless. I have one of her other books on hand to read as well. I’d like to read that Jude Morgan as well! Oooh, pretty stack! I’ve read exactly none of those. Need to read something by Angela Carter, someday. Nymeth – I think it was you who first really made me put Carter on my list. I can’t wait to read her novels. They sound so different! Sandy – Some were even less than half price! I got a cookbook too for Christmas and I had to laugh as I guess that’s a big hint that I need to learn 🙂 Good luck to your son! Samantha – I am looking forward to them! Literary Feline – Did you read Sleeping in Daylight? That’s the one I’ve read which I really liked. I’m hoping this one will be just as good. Heather T. – Yay, so glad to hear you like his books! I hope it’ll be a good book. Our last mystery read wasn’t so hot. Danielle – I also have another of her books. They sound like good women’s fiction type books. Can’t wait to read them. Bookfool, aka Nancy – I’ve been wanting to try something by Carter for a while now and so I’ve got several books of hers to choose from so no excuses! Carter’s books are so very different, Iliana, and I hope that you enjoy them. Shadow Dance (Honeybuzzard in US) was her first novel and is by no means perfect but The Passion of New Eve is like nothing else you will ever read and would also be perfect for the Women Unbound challenge! Enjoy. I have purchased The Passport by Herta Muller but that’s it so far for 2010. Great finds! My husband likes Giles Blunt. I’ve read two Angela Carter books but I can never remember which ones. I do remember I liked them both though. Enjoy your new treasures! I used to read a lot of Carter books years ago before she died. I recently picked up The Passion of New Eve too; it was one I hadn’t read, so I am looking forward to it too. “Black Fly Season” is part of a series, the first being “Forty Words for Sorrow”. The latter is on my list of books to read. happy reading 🙂 I havent read any of these myself. Black Fly Season does sound good. I took my kids to Indigo today and although I did have a few books in my hand (all books I would have used in the classroom) I didn’t purchase any. How would it look if I broke my vow of book-celibacy this early in the year!? Of course – now that I’ve seen your pile I’m breaking out into a cold sweat! Paperback_Reader – Oh I’m really looking forward to the books! And, I may just have to change one of these out for my challenge 🙂 I’ve got The Passport too and am hoping to get to it soon. vivienne – I don’t think I’d ever heard so much about Carter until I started blogging. One more reason to love blogging right? I hope I’ll enjoy her books. Sophie – Ah, thank you for letting me know. I do like to read books in order but my mystery book group doesn’t care about that. Oh and if you do decide to start blogging let me know. You’ll find the book blogging community is wonderful! Tiffany – Too funny. I think you owe yourself some fun book purchases! Christie – Ha,ha.. I guess you couldn’t buy them but boy is that resolution going to be hard! Good luck! christine – Ah, I love that! Thanks girl and I know, I think Michael is scared that I keep mentioning that I have empty spaces in the bookshelves. looks like you got some great books…happy reading. Indiscretion is such fun! I actually got given free books at work yesterday – that never happens, will show everyone my haul soon. I haven’t read any of these, but I hope you enjoy them! Serena and I are going book shopping this weekend. There’s a library sale AND we must spend those Christmas gift cards! !